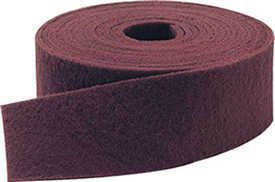 Shur-Brite rolls offer the flexibility required for many cleaning, blending, finishing, and polishing applications. Rolls can be cut to size with scissors for hand or machine use. They are recommended for all types of ferrous and non-ferrous materials and great on stainless steel. Our wide selection will handle jobs ranging from rust and corrosion removal to satin and decorative finishing.